The problem is, Mike flew the wrong way. Mike Hughes goes the wrong way. Photo ©2018 Mike Hartman/Associated Press. Please see Image Credits section at end of article for disclosure on use. Hughes took off vertically. Even had he seen the curvature of the planet, he would have been subjected to the endless conspiracy theories flat earthers apply to NASA footage showing said curvature, where lens distortion or other photo trickery is blamed. No, a better approach would have been to simply board an airplane and fly horizontally until the edge was reached. A bevy of photos of the alleged disk-shaped planet hanging there in space would have surely earned Hughes a Nobel Prize in physics. To help Hughes in his next attempt, and/or as a challenge to any other flat earthers out there, I’ve laid out a highly detailed scientific diagram of the proposed process below, presented free to the flat earth scientific community to help them in their efforts. Rocket takeoff ©2018 Mike Hartman/Associated Press. Used under provisions of Title 17 U.S.C. Section 107, commonly known as “fair use law”. This material is distributed without profit with the intent to provide commentary, review, education, parody, and increase public health knowledge; specifically cases where no publicly available image of the event being discussed is available. Mike Hughes headshot and flat earth graphic used under parody provisions of Title 17 U.S.C. Section 107, commonly known as “fair use law”. This material is distributed without profit with the intent to provide commentary, review, education, parody, and increase public health knowledge; specifically cases where no publicly available image of the event being discussed is available. Airplane photo by the author. In this artist’s depiction, a Moms Across America stormtrooper charges across a field of GMO “Bt” corn armed with a bottle of David Wolfe’s neem oil pesticide/tooth treatment. Moms Across America members are prone to running through corn fields in unnecessary protective gear. Scientists are still trying to understand the phenomenon. David Avocado Wolfe has never met a pesticide he likes, even going so far as to trump up a charge against a plant derived chemical for allegedly causing premature death of fruit flies.1,2,3 Oh, the humanity! 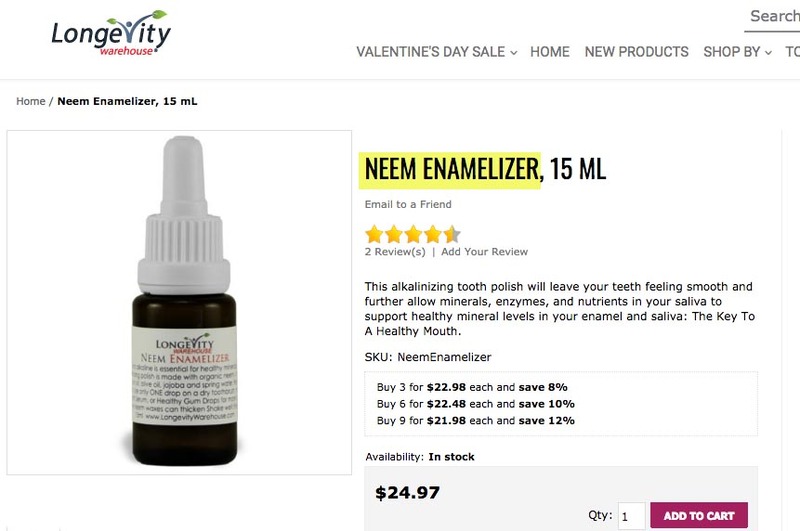 A 15ml bottle of Neem Enamelier from David Avocado Wolfe’s store. (click/enlarge). Neem oil is an organic pesticide. 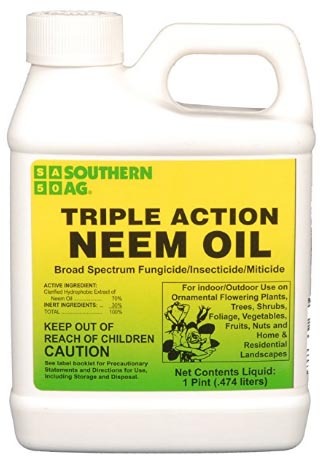 Neem Oil, a broad spectrum pesticide/fungicide/miticide sold on Amazon. Click to enlarge. 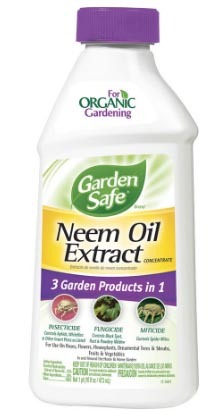 Neem Oil pesticide sold by Lowes. Click to enlarge. In addition to not knowing what’s in his own products, David Wolfe doesn’t seem aware that organic farming uses pesticides, if you believe the false words that spill forth from his keyboard like Noah’s Flood.7 Or, maybe he just doesn’t care. Here at Bad Science Debunked, we’ve lost count of the products sold by Wolfe’s Longevity Warehouse that contain the same chemicals he falsely claims will kill you. Now, it is possible to process neem oil to remove azadirachtinone, one of the more irritating chemicals,8 but processing an all-natural product would go against everything Wolfe believes in and, in fact, I contacted the manufacturer of his tooth enamelizer and they confirmed that indeed, it comes to you, the end user, straight from the tree, untouched and unprocessed in any way. According to the National Pesticide Information Center (a cooperative agreement between Oregon State University and the U.S. Environmental Protection Agency), neem oil can be slightly irritating to skin and eyes, but its component azadirachtin, which I mentioned previously, can be very irritating to the skin and stomach.8 And you’ll find it in every bottle of Wolfe’s enamelizer. Over the lips and through the gums David Avocado! Warning: Not a scholarly or scientific article. Contains false and/or misleading information. Warning: Not a healthcare product. See FDA disclaimer on package. The lead image of an irate “Occupy Monsanto” member running trough a cornfield was used under provisions of Title 17 U.S.C. Section 107, commonly known as “fair use law”. This material is distributed without profit with the intent to provide commentary, review, education, parody, and increase public health knowledge. Similarly, the image captures of David Wolfe/Longevity Warehouse’s Neem Oil product, and Lowe’s Neem Oils Pesticide, are used under provisions of Title 17 U.S.C. Section 107, commonly known as “fair use law”. This material is distributed without profit with the intent to provide commentary, review, education, parody, and increase public health knowledge. Mike “The Health Ranger” Adams has been a frequent guest here at Bad Science Debunked. We’ve caught the anti-GMO fanatic hypocritically pushing GMO products1 (more than once)2, and hawking formaldehyde3 in pain relief formulas while simultaneously screaming about the compound’s toxicity. Because I believe in free speech, I’ve obtained a copy of the Adams’ Wheaties video and resurrected it–in true Internet “I Fixed That For You” style. In my video, we use Health Ranger Blood Builder,6 a product I purchased from Mike Adams’ own online store. The Ranger’s argument is that if a food product is attracted to a magnet, it must be full of metal shards. 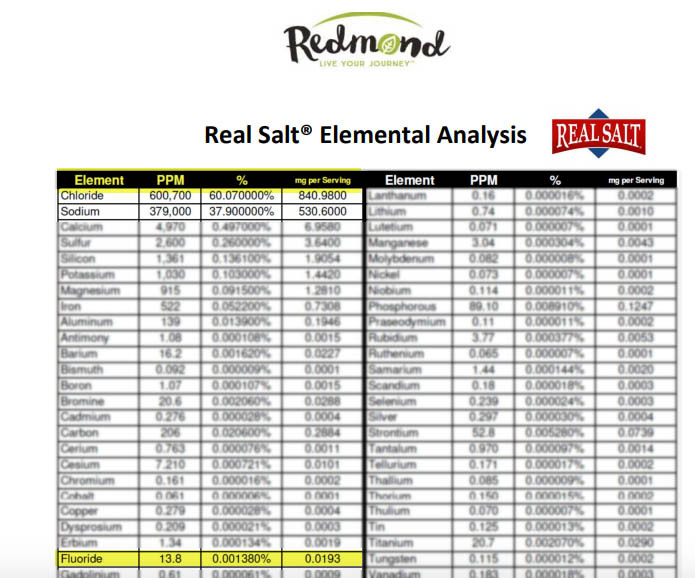 With Health Ranger’s own product on the ol’ kitchen lab table, let’s put that claim to the test, shall we? 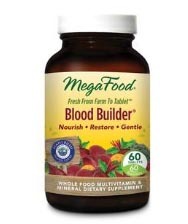 I purchased my bottle of Health Ranger MegaFood Blood Builder tablets6 in late 2017 for approximately $30. This is due to the way that rare earth magnets are manufactured. You’ll notice that my magnet is cube shaped, while Adams’ is rectangular, and, indeed, the Wheaties only stick to the edges of the both magnets. The magnets didn’t come by these shapes naturally. According to my magnet’s manufacturer, the element neodymium is literally packed into the desired form during the manufacturing process. The brittle material is later encased in a rust-proof alloy for protection. The end result is a higher density of neodymium along the edges of the respective magnets (which aren’t even magnetized yet–they’re “zapped” with an electrical current at the end). The higher density of magnetic material results in a higher pull strength at the edges; this is where the tiny ferromagnetic particles in the food products are pulled. Finally, as part of my niece’s fifth grade science fair, she did a version of this experiment (yes, a fifth grader can easily debunk the Health Ranger.) Part of my niece’s experiment included a control group of fine-grained non ferro-magnetic materials such as salt, spices, etc. None were attracted to the rare earth magnet. If static electricity was the culprit, I’d expect a response from something besides just ferromagnetic materials. This article was updated on March 12 to add a questions and answers section. Mike Adams/Health Ranger/Natural News video excerpts are used in strict compliance with Title 17 U.S.C. Section 107 of United States copyright law (commonly known as “fair use law”). This material is distributed without profit with the intent to provide commentary, review, education, parody, and increase public health knowledge. Snake Oil intro image used under parody provisions of Title 17 U.S.C. Section 107 of United States copyright law (commonly known as “fair use law”). This material is distributed without profit with the intent to provide commentary, review, education, parody, and increase public health knowledge. 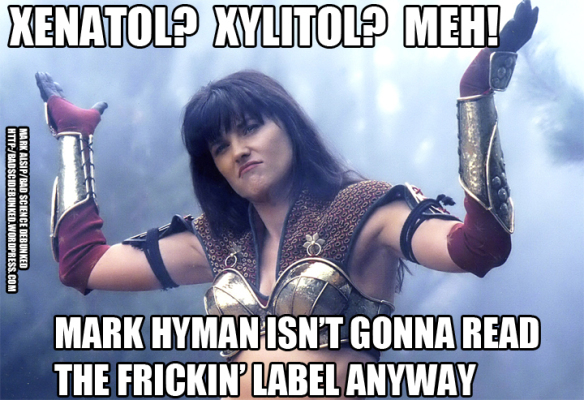 Dr. Mark Hyman tells us that xylitol is addictive and leads to obesity, metabolism disorders, and addiction, but that doesn’t stop him from loading it into his children’s daily vitamin supplement. 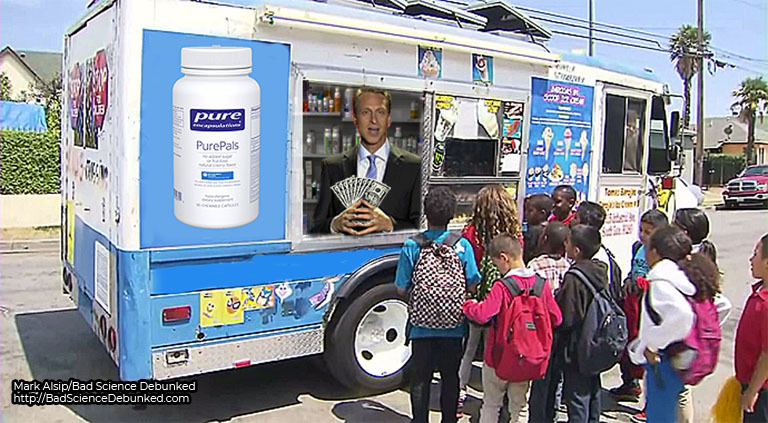 It’s been a while since we last heard from Dr. Mark Hyman, the hypocritical doctor who openly sells a product filled with the same chemicals he falsely claims causes cancer. Actually, he’s selling two such products. Well, OK, there are over a half dozen. But I digress. Good Lord! According to Hyman, xylitol is responsible for increased risk of obesity, rewiring your brain chemistry and metabolism, and is highly addictive.1 Sounds pretty dangerous! Something you’d especially want to keep away from children, right? Wait a minute, that’s xylitol in them thar pills!2 Doctor (and I feel embarrassed to use that word) Hyman recommends one gram of xylitol per day for children aged 2-3, and two grams per day for those aged 4 and up.2 Remember, this is the sugar substitute that’s supposed to be highly addictive, increase obesity, and rewire your children’s brain chemistry. Yet the man making these claims wants to feed it to your children daily, at a cost of $27.60 per bottle. But, what should one do upon finding any of these candies in the kitchen of their home? According to the good doctor: throw them out immediately!4 I kid you not. Read Hyman’s polemic “Four Steps To Detoxify Your Kitchen“4 lest you think I exaggerate. 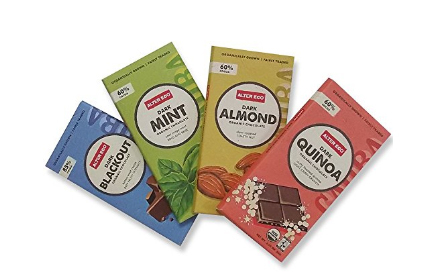 According to PubChem, xylitol can be produced industrially starting with, for example, a variety of natural sources, including almond hulls and birch bark,5 but it’s important to remember that everything is a chemical, so “artificial” and “natural” are just arbitrary labels. 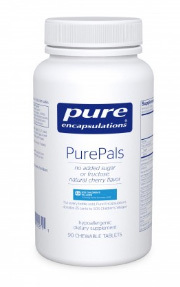 Ironically, the PurePals vitamin product is manufactured by Pure Encapsulations, the same company that makes Neuromins, another Hyman product that contains chemicals the doctor hypocritically and falsely links to cancer.7 Why would a doctor claim his own product causes cancer? Because once the man says “hello, I’m a doctor,” people stop paying attention, bend over, grease up, and proceed to get screwed. Mark Hyman imagery and Pure Encapsulation screen snapshots and product image captures are used in strict compliance with Title 17 U.S.C. Section 107 of United States copyright law (commonly known as “fair use law”). This material is distributed without profit with the intent to provide commentary, review, education, parody, and increase public health knowledge. Ice Cream Truck/Candy Man parody image by the author, also produced and used under the parody provisions of Title 17 U.S.C. Section 107 of United States copyright law (commonly known as “fair use law”). This material is distributed without profit with the intent to provide commentary, review, education, parody, and increase public health knowledge. Vani, it’s time to start reading your own product labels. 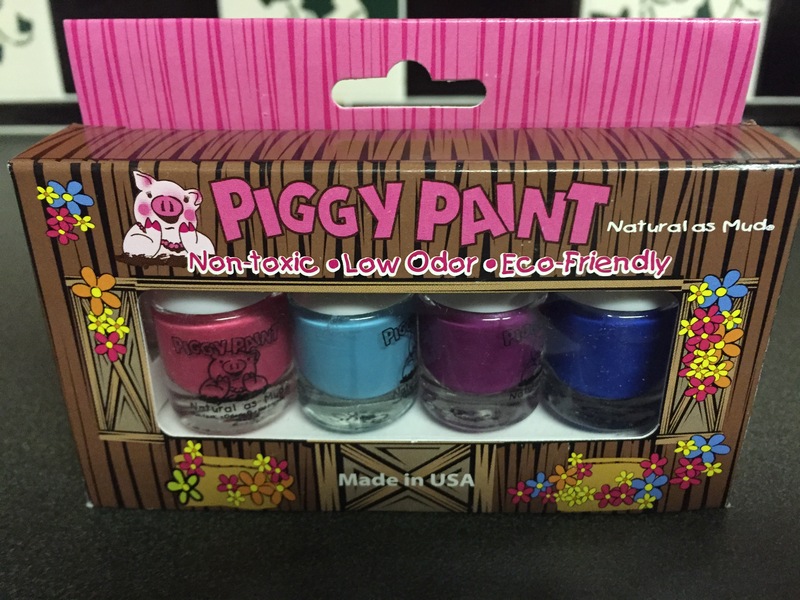 Piggy Paint and Food Babe screen snapshots and product image captures are used in strict compliance with Title 17 U.S.C. Section 107 of United States copyright law (commonly known as “fair use law”). This material is distributed without profit with the intent to provide commentary, review, education, parody, and increase public health knowledge. Food Babe is back with a list of holiday stocking stuffers for the kids things she wants to sell you and, of course, the list is loaded with the same ingredients she says will kill you, or violates rule after rule she dictates to her followers. It all started with a post dissing Lindt Truffles, my favorite.1 How could I resist taking this on? 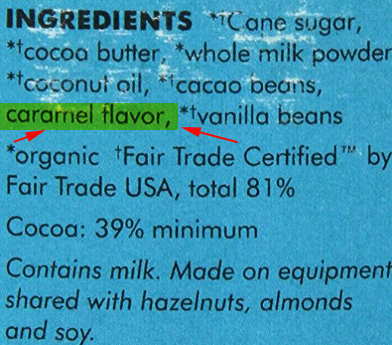 Let’s step through Food Babe’s list of alternative candies and see how she’s hypocritically misleading her followers. We’ll close with a brief reexamination of her ethically questionable use of hidden affiliate links. 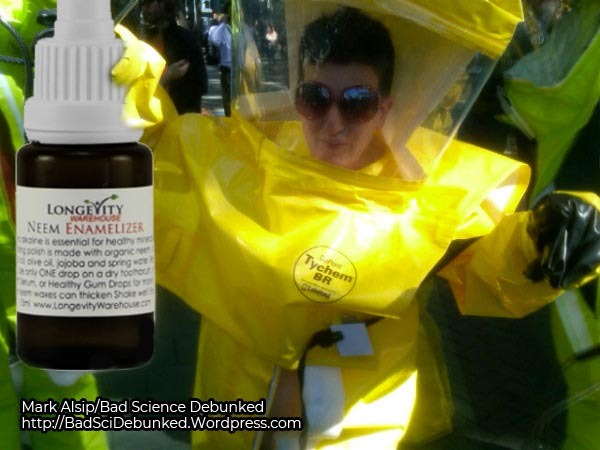 Vani loses her sh… uhm, cool, when manufacturers don’t use “real” ingredients in their products. Now, you can’t go pick a caramel fruit off a tree, but there is a known way to make caramel, involving sugar, butter, milk, etc. You’ll find none of these in Vani’s replacement for Lindt truffles. 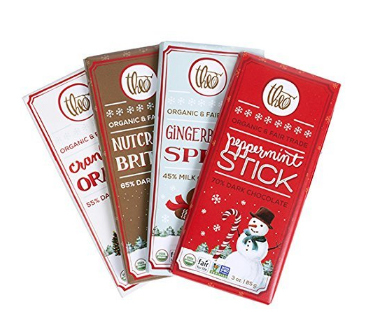 Instead, Alter Eco artificially manufactures a caramel taste using plant extracts, spices, fruits, vegetables, and tree bark.2 This according to an email from Alter Eco’s customer service department. Theo Chocolate Nutcracker Brittle dark chocolate contains Pink Himalayan Salt.4 While Theo doesn’t provide a chemical analysis of the salt in their chocolate, I’ve written about this miracle salt many times, including here5 and here.6 It’s typically found to contain trace elements of lead, arsenic, aluminum, mercury, and a host of other elements that hide under Vani Hari’s bed and give her nightmares on a regular basis. Vani and her compatriots claim these metals accumulate in your body, slowly poisoning you–but she’s happy to sell you detox products to save the day! 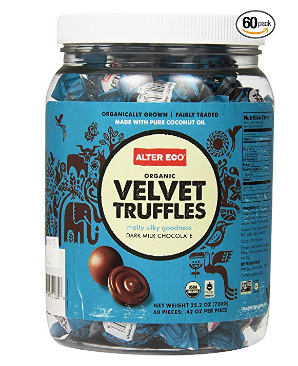 Alter Eco Dark Chocolate contains rice. Vani Hari warns that rice is a prominent source of arsenic. Yes, rice and arsenic, it’s what’s for dinner at Vani’s Restaurant. There are dates in this candy. 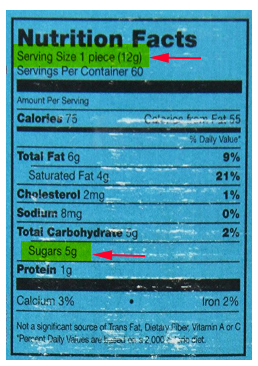 The United States Department of Agriculture lists varying sugar amounts of sugar for dates, from 93.1 grams for one cup of deglet noor dates to 15.95 grams for a single (pitted) medjool date.9 Kur doesn’t tell us the type or amount of dates added to their chocolate bars, but nonetheless, sugar is sugar, and it is there, added when the dates were put in the mix. One grows weary of this Appeal to Nature fallacy10, where something derived from nature is supposedly “good” for you. 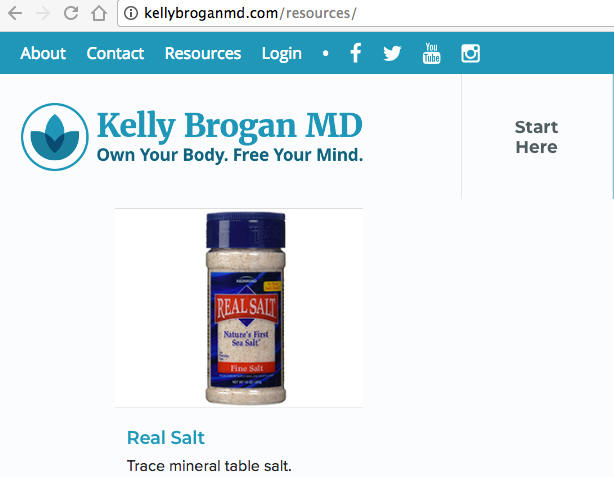 Food Babe’s sugar is the same sugar she disparages. Sorry, Vani. 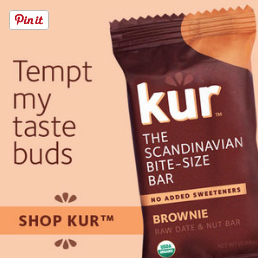 I also have a scientific bone to pick with labeling their products as “non-GMO”.11 Looking at the Kur Brownie Pack, for example, the ingredients are: Dates, Cashew Butter, Cacao Powder, Almonds, Cinnamon, and Essential Oil of Orange. Of these, not a single ingredient is commercially available as a genetically modified crop. The non-GMO label has become a slick marketing trick to take advantage of consumers, and is being applied in some outlandish ways. It’s meaningless in this context. Before you know it, they’ll be advertising non-GMO condoms. Oh dear, I spoke too soon. All of the recommended products in Food Babe’s stocking stuffer list are tagged with hidden affiliate links. Encoded in each hyperlink is a code that gives Food Babe not only a percentage of your purchase price of her recommended product, but also any other qualifying purchase you make on Amazon in the future. Buy a TV, a computer, etc. for Christmas or Hanukkah gifts, and you are lining Vari Hani’s pockets with a percentage of your purchase price of those products as well. I’ve decoded the process for you below. 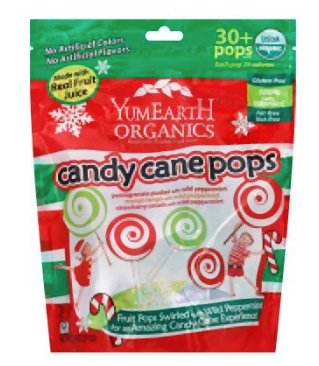 You can see Food Babe’s affiliate code, “foodbab-20”, after it’s been decoded from the “2lW5YIG” parameter passed to Amazon when you click on her organic mini chocolate peppermints link. If you read Amazon’s agreement for affiliates12 and then search for Food Babe’s disclosure of what’s happening on her page, I believe you’ll come to the conclusion I have: something’s not quite right here. This article has been updated to reflect nutritional content of Hari’s brands vs. those she maligns. 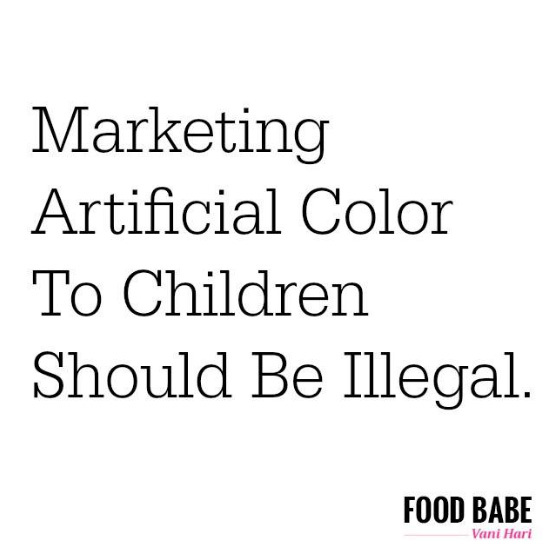 Food Babe, Theo, Kur, Alter Eco, Google, Amazon, YumEarth, and all other product/branded imagery shots are used in strict compliance with Title 17 U.S.C. Section 107, commonly known as “fair use law”. This material is distributed without profit with the intent to provide commentary, review, education, parody, and increase public health knowledge.